I’m not even fit to take care of a houseplant. Despite this, King and his plant-loving fairy named Meu think it would be a good idea for me to help them restore the kingdoms plant life to its former glory. Perhaps its my amazing drawing skills, or perhaps these aren’t actually real people and I’ve just happened to purchase an app for my iPad that involves me drawing to save plants. 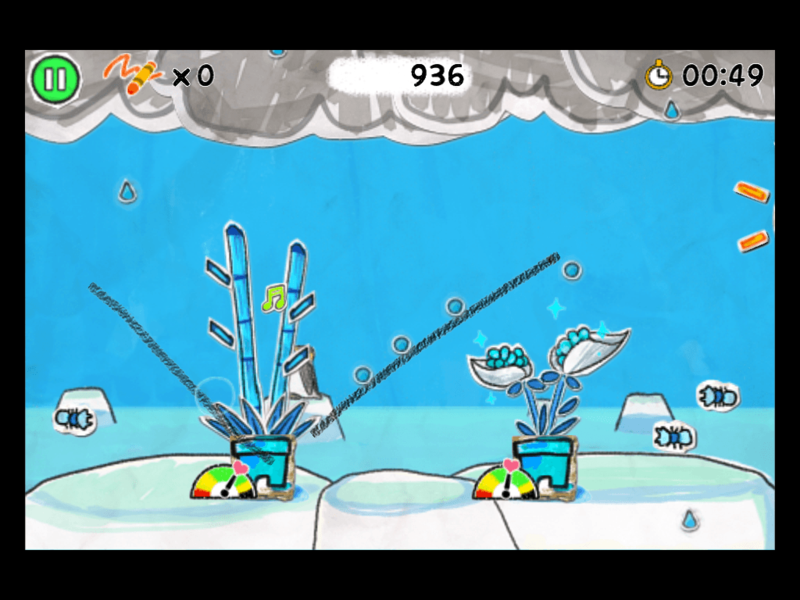 Regardless of whatever narrative you decide to believe, Taito’s latest game for iOS devices requires you to draw lines in order to help plants, and subsequently the kingdom, to flourish. Time to put on your gardening gloves and head out doors to play Drawin’ Growin’ (please note: Drawin’ Growin’ can also be played in doors, and without the aid of gardening gloves). Drawin’ Grownin’ is a slightly misleading title. Sure there is growing, if you are half decent at the game of course, but there is a lot more going on then just drawin’. At first the game is very basic. Sunrays fall from the sky, and it’s up to you to draw a path for them to reach the plant. 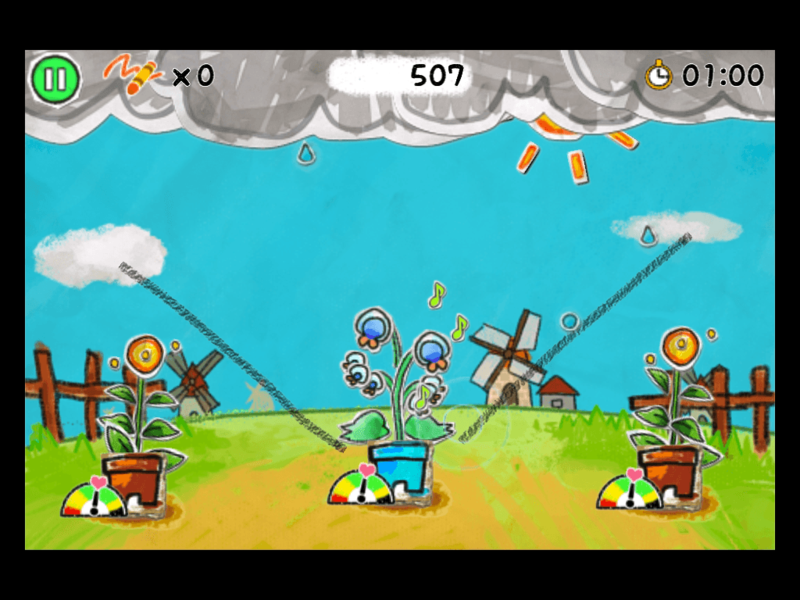 As the game progresses it becomes more complicated to raise happy and healthy plants. It also seems that not all plants will flourish in the sun, only those with brown pots will enjoy the sunlight, while those with blue pots prefer the rain. 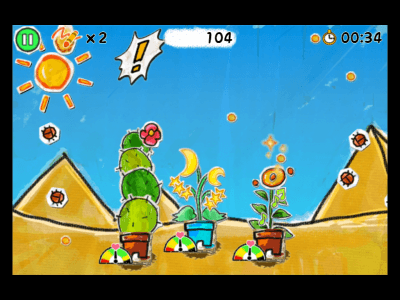 The further into the game you progress, you will come across plants that must be tapped in order to grow, or ones that luckily survive and grow by eating bugs, however you will have to feed them to the plant. I’ll be honest, I had no idea gardening was such a difficult and dangerous business. Drawin’ Growin’ is littered with bugs. The further I progress, the more insect life there seems to be. Much like real bugs, they can be defeated with a swift tap. But when they come in hoards this size it gets a little difficult to exterminate them all. If the bugs weren’t enough, high winds, piles of sand and snow, falling icicles and lighting bolts also threaten my beautiful flourishing garden. These can be deflected by drawing a shield over the plants, but it soon becomes very difficult to manage attention when you have all of these hazards and three plants to tend to, all of which require different types of attention. There are also a number of different level types to play through, all of which are grounded in the core mechanic of growing plants. Standard is exactly what it sounds like, you grow plants. Harvest, again, pretty self-explanatory. You grow plants that are then picked and then you grow more until you complete the goal. Defense requires you to protect already grown plants from the hazardous bugs and natural disasters such as lightening. Last, but certainly not least, there is the most difficult game mode, three steps, which is essentially playing three standard games in one time frame. It’s seems that we the players aren’t the only ones drawing. The team over at Taito Corp. have been busy with their pencils drawing away to create some stunning graphics for Drawin’ Growin’. Terrifically shaded characters come to life on their very own bits of paper, which are layered with a collage like effect through out the game. A variety of different plants have unique colours and designs, fitting to the type of attention they require. 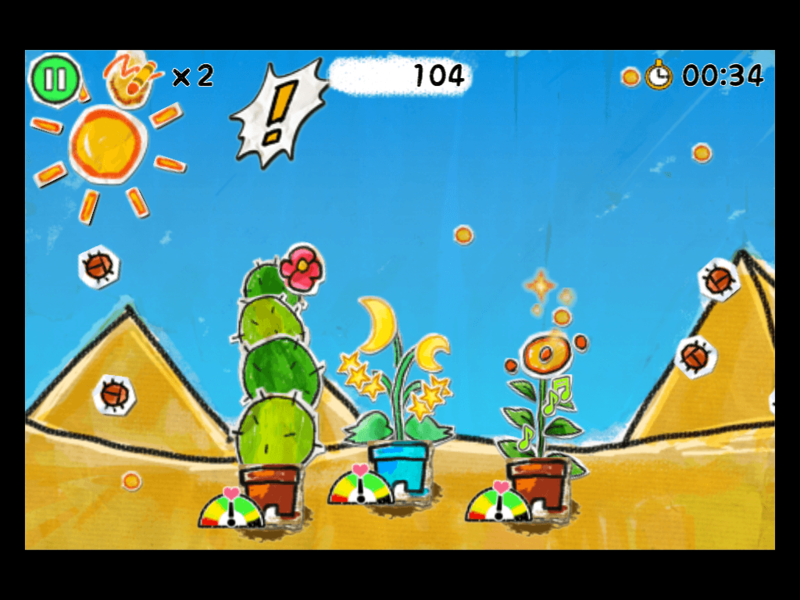 Plants will (hopefully) grow in amazing, yet simplistic environments that retain the same hand drawn quality as all the other game elements. 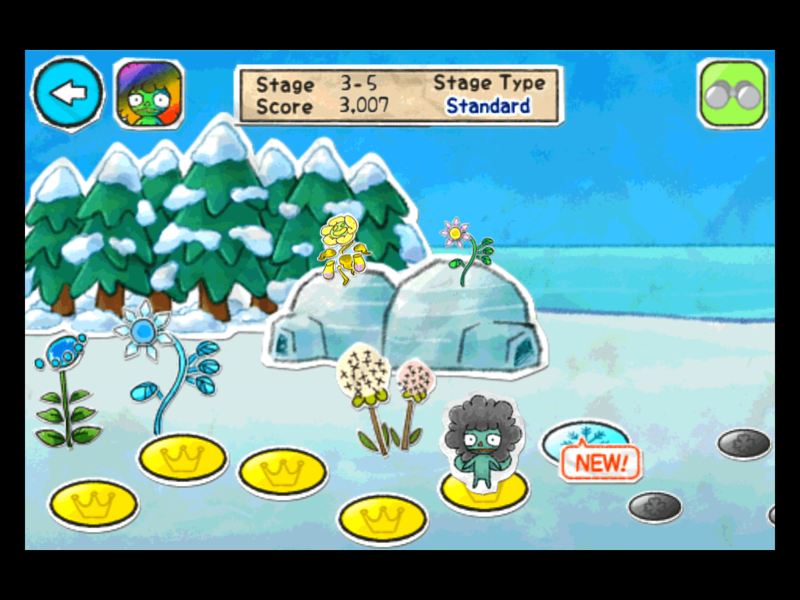 What is particularly wonderful is the level select areas that flourish with plant life the more levels you complete. Sadly the audio doesn’t add all too much to the title, but does help remove some blandness to the game that is slightly noticeable when playing the title with the sound off. extremely difficult to master. 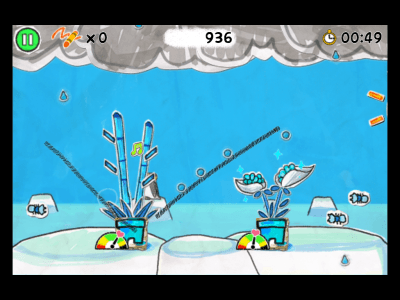 While the mechanics stay the same, not leaving much room for variety, the levels gradually become a little too taxing. Differences between game modes are sometimes very minimal, and at times it just feels as if you are tapping and swiping the screen at random. 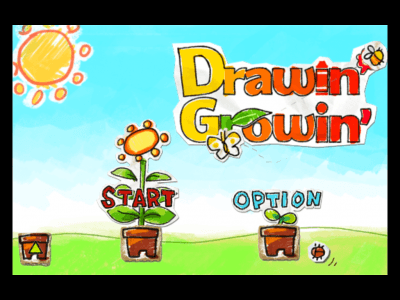 While Drawin’ Growin’ starts off as a rather basic game, and progresses to an enjoyable casual game, it unfortunately keeps going and becomes a little too frantic to enjoy casually. 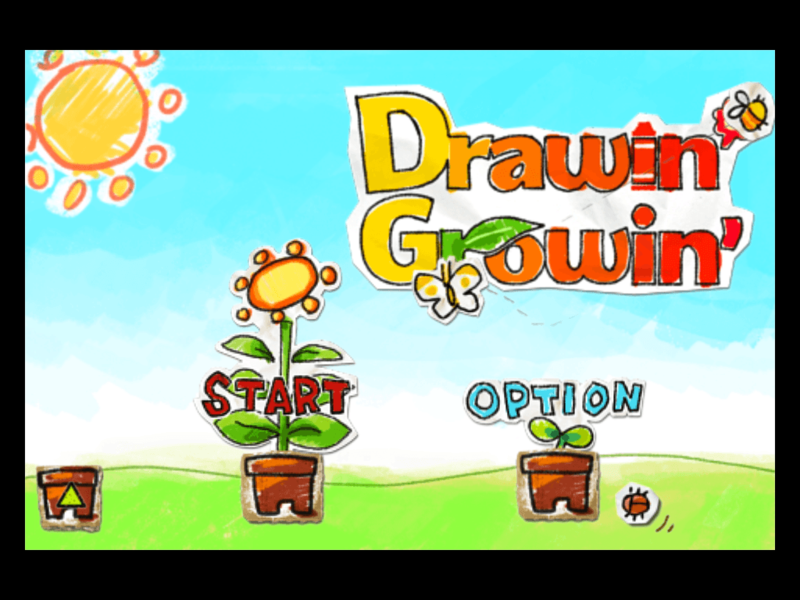 If you are looking for a game that will progress into a challenge, with a unique artist approach, then Drawin’ Growin’ will be worth your time. If you are looking for a throw away title to play sporadically, perhaps give this one a miss.